The big dance is HERE. We have our eight teams, our four all arounders and our 15 individual event specialists. And over the next two days, we’ll be breaking down all the team and individual prospects for not only advancing to finals but winning the six national titles up for grabs. First we’ll take a look at the teams. Friday will feature No. 2 UCLA, No. 3 LSU, No. 5 Utah and No. 6 Michigan in session one and No. 1 Oklahoma, No. 4 Denver, No. 7 Georgia and No. 8 Oregon State in session two. Two teams from each of these Friday competitions will advance to the national finals on Saturday and compete for a chance at the national championship. There are also individuals that will compete on Friday with individual titles and All-America honors on the line, but we’ll get to that tomorrow. For a more in-depth explanation on the new postseason format, check out our NCAA postseason format explainer. Finally, don’t forget to follow your progress in the 2019 bracket challenge here. This session is likely to be the most exciting of the whole weekend. It’s far and away the more competitive semifinal by the numbers, and from any angle we can think of, that’s likely to pan out. UCLA cruised through the Ann Arbor regional, with the exception of a bizarre and ultimately dropped fall in the first routine of the regional final, and they ought to be safe here. We’ll be watching to see if they have the extra sparkle it will take to contend with Oklahoma on Saturday. LSU is dealing with a barrage of minor injuries, but on the whole it’s a more balanced team. Utah has been marginally more consistent through the season but had a lackluster showing at regionals where it lost to the hampered Tigers by a quarter of a point. Michigan survived perhaps the scariest regional final, beating out a surging Alabama and thwarting Nebraska’s uncanny knack for postseason upsets. The best argument against Utah is that its best score outside of its home state this year is a 197.450. That’s a fairly humble total in the context of this final. The best argument for it is that the injury concerns surrounding LSU have the potential to be quite serious. If Durante’s fingers, Priessman’s bicep and Kelley’s groin haven’t healed since regionals, things could get tight, especially since LSU’s backup routines might get less benefit of the doubt from the judges in Fort Worth than they did in Baton Rouge. For Michigan to have a chance, the goal is very simple: stick. everything. The Wolverines can compete with the best release for release or acro series for acro series, but even at regionals their landings felt very February. If they can fix that, they might just be able to squeak in on their own terms with a score around 197.500 instead of having to hope for mistakes. For UCLA, a great deal hinges on the No. 2 and No. 3 spots on bars. The peak-scoring choices for those two gymnasts are Nia Dennis and either Glenn sister. (Grace has a very slight technical edge, but Anna is more consistent, so it’s a toss-up.) However, the Glenns have struggled to hit their Pak saltos recently, and Dennis is competing on a shoulder injury. That means that the Bruins are often forced to use messier routines from Felicia Hano and sometimes Macy Toronjo. The only thing more fascinating than who the Bruins put up in those two spots is what scores they receive. For LSU, Priessman and Durante need to be ready for bars, because the alternatives are not at the level of the rest of the lineup. There’s nothing I can tell you that you don’t already know about Oklahoma. The Sooners have more or less cruised through 2019, and despite a slightly larger drop-off after the top four or so routines per event than we’re used to, it would take a disaster for OU to lose to anyone but UCLA this weekend. Oregon State is almost as likely out of the picture as Oklahoma is in; while the Beavers’ ability to keep their cool to finish off Florida at home two weeks ago was amazing, they just don’t have the road peak score to challenge the rest of the group here. The dynamic between Georgia and Denver is the interesting part. Georgia set a season high at its home regional final, and while it’s far from unjustified to raise an eyebrow at the scores any team received at that meet, the Bulldogs were genuinely stellar. Denver meanwhile came out on top in Corvallis after Florida collapsed but hasn’t put together a meet that feels nationals-caliber in quite a while. 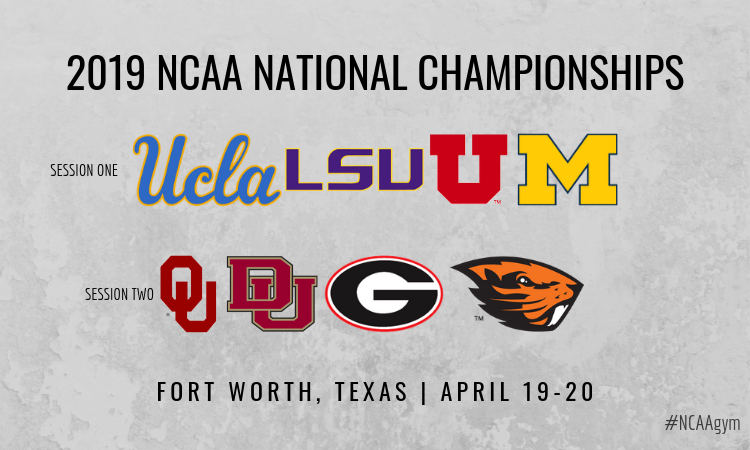 The two outside teams here both qualified to Fort Worth out of home regionals, so it’s difficult to gauge exactly what they’ll be able to produce on the road. Oregon State has earned the four highest scores of its 2019 season at home, so in all odds its amazing season ends here. Georgia, though, enters with a real chance. Like Utah, its top road score of the season is a 197.450. Unlike Utah, the team the Bulldogs are trying to upset may not be peaking at the right time. Denver hasn’t beaten that 197.450 mark in over a month while Georgia brought the house down at its regional final less than two weeks ago and walked away with its first perfect 10 of the year. Georgia volunteer assistant coach Suzanne Yoculan Leebern’s expertise might prove more valuable than ever before. In any sport when margins are narrow, a result can come down to belief, competitive ability and a bit of luck. Yoculan Leebern seems to provide the Gymdogs with all three—plus, she’s coached this team to 22 top-four finishes in her storied career while Denver’s Melissa Kutcher-Rinehart is looking for her first. In certain lineup configurations, Denver runs four all arounders. Whether or not Alexandria Ruiz and Mia Sundstrom compete all four on Friday, they’ll need to be more 9.900 and less 9.750 if the Pioneers want to ensure their place above the Gymdogs. For Georgia, it’s been over a month since the last bars-pocalypse and it’ll need to stay that way. Expect plenty of hard Suzanne stares directed at Rachel Dickson and Rachael Lukacs, who have been the most error-prone of the group.